Breakfast. Start your full day visiting the Egyptian Museum of antiquities. On display is a rare collection of 5000 years of art the largest most precious collection of Egyptian art in the world. Over 250,000 genuine artifacts are presented, including an exhibit dedicated to the Tutankhamen collection of treasures, gold, and jewelry. Visit the Great Pyramids -Cheops, Chephren & Mykerions. Cheops is the most colossal ever built. Next is a close-up look at Sphinx - a huge funeral complex guarded by the legendary lion body with the face of king Chephren. Then visit Khan El Khalili Bazaars. Shops in this district are legendary for fine brass ware, copper, perfumes, leather, silver, gold, antiques …etc. To the train station for your overnight Sleeper train to Aswan. Dinner on the train.Overnight in Sleeper train. Breakfast on board. and around 4:30 am Pickup from the Nile Cruise by our Representative and transfer to west Bank where take off Point for Hot air Balloon: Should you want to make your stay in Luxor an unforgettable. Drifting peacefully over the Valley of King, Valley of the Queens and the Mountain on the Nobles. After drive to the West Bank to visit the Valley of the Kings, the Temple of Hatshepsut and the Colossi of Memnon. The Excursion to the Valley of Kings; visit the tombs of various Dynasties, The Temple of Deir El Bahari. On the return journey stop at the Colossi of Memnon which are two gigantic sitting statues representing Amenophis III facing the Nile. Then visit the Temple of Queen Hatshepsut.Lunch on board. Afternoon free at leisure. Afternoon Tea. Then Transfer to the Train Station to take your overnight Sleeper train to Cairo. Dinner on the train. Overnight in sleeping train. Breakfast in train. Arrival to Cairo, meet & assist by our local representatives and transfer to the hotel Check in quick shower then Start your day Tour Old Cairo that known as Christian Coptic Cairo which is Among the most important locations visited by the Holy Family where the spiritual impact of their presence is most felt still; though their stay was brief, for the Governor of what was then Fustat enraged by the tumbling down of idols at Jesus' approach sought to kill the Child. But they took shelter from his wrath in a cave above which, in later years, the Church of Abu Serga (St Sergious) was built. This, and the whole area of the Fort of Babylon, is a destination of pilgrimage not only for the Egyptians but for Christians from around the world. An air of piety and devotion pervades the whole district there. Also There you will be able to visit and Enter the Church of Abu-Sergah and St. Barbara, the hanging church, and the old jewish synagogue - Ben Ezra Synagogue. Breakfast at the Hotel Then at 7:00 am Pickup from your hotel by our expert Tour guide to Start your full day tour to Alexandria Full day (the Roman Theater & the Catacombs of Kom El-Shoqafa with Lunch): Transportation Cairo-Alexandria-Cairo (by air conditioned Vehicle) includes a visit to The Roman Theater(A theater with marble seats up to 800 spectators, Galleries, Section of mosaic flooring & a pleasure garden surrounded by Roman Villas& baths). Followed by lunch. Then a visit to The Catacomb of Kom El-Shoqafa (Tombson three levels, also contains the Tri-cilium where relatives used tosit on stone benches to feast the dead, a center with relieves ofbearded serpents, Inside are 2nd Century AD statues of Sobec &Anubis wearing Roman Armor). Library.The tour includes lunch.Followed by Visiting Elsawary, Alexandria Library& Also from out side you will Visit Qaytbay Citadel & El Mursi Abu Elabas At the end of the Day Transfer you Back to Cairo . Overnight stay in Cairo. 3 Nights on Cruise board (Aswan & Luxor) full board (sight seeing included). 2 Nights Sleeper train on Half Board basis. 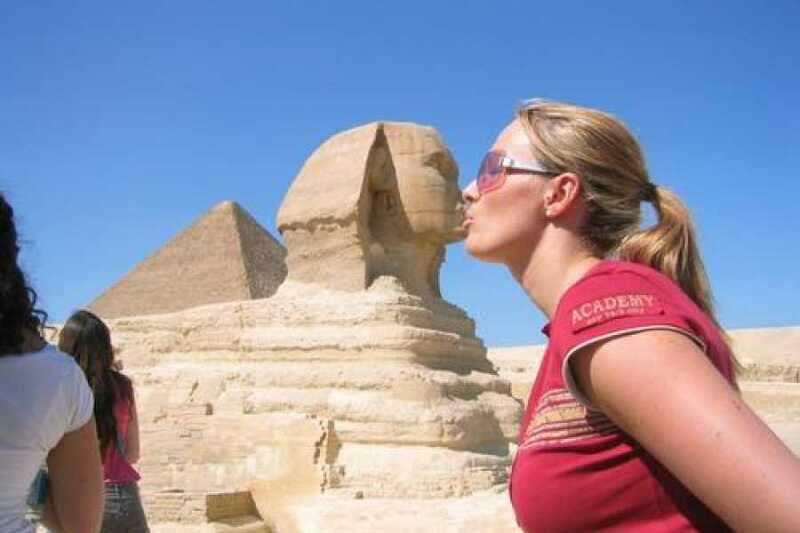 1 Full day tour in Cairo visiting the Egyptian Museum, the great Pyramids, and Sphinx & Khan El Khalili.